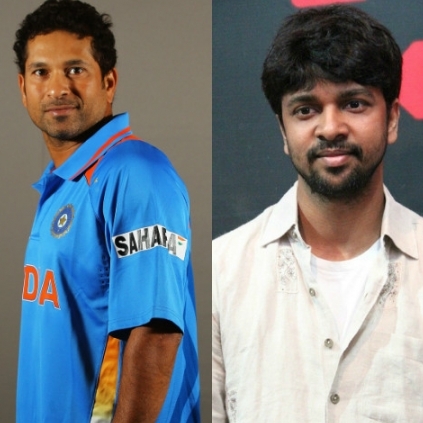 Madhan Karky, the prolific lyricist has written three songs in the Tamil version of the film Sachin: A Billion Dreams and we caught up with Madhan to shed more light on this. “Rahman sir informed me that a team from Mumbai would call me for songs. At first, I did not know it was for Sachin. When I knew, I was thrilled because from my childhood, I have been a fan of Rahman sir and Sachin and they have been my inspiration. I would attribute the main reason for my interest in cricket and music to Sachin and Rahman sir. It was wonderful writing for Sachin. I felt very happy when I was writing for the people who have been my inspirational force. There are totally three songs in the film and I have written all the three. Karthik, Sid Sriram and Vishwaprasad (winner in Zee junior supersinger) have each sung one number. This is the first time I am associating with Rahman sir for an entire film which is very special to me. All the three songs are inspiring ones and would convey WE CAN WIN. One song, I have made it like a warrior facing a battle and the whole world behind him; another one is the Sachin Anthem sung by Sid Sriram and the third one is a childhood song of Sachin, a playful one in folk style. The film is releasing on 26th May and I am quite excited about it”. People looking for online information on Madhan Karky, Sachin A Billion Dreams, Sachin tendulkar will find this news story useful.